Posts related to retinal disease. 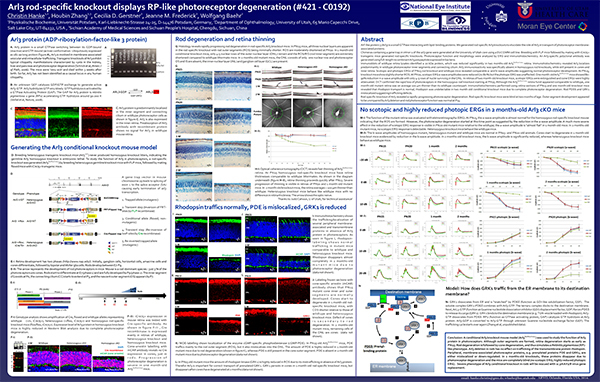 This abstract was presented today at the 2014 Association for Research in Vision and Opthalmology (ARVO) meetings in Orlando, Florida by Christin Hanke, Houbin Zhang, Cecilia D. Gerstner, Jeanne M. Frederick AND Wolfgang Baehr. Full size poster can be downloaded here. Purpose: Arf-like protein 3 (Arl3) localizes predominantly in the photoreceptor inner segment. Germline Arl3 knockout mice do not survive beyond PN 21 and display multiple organ ciliary defects as well as retinal regeneration (Schrick et al., (2006). Am. J. Pathol. 168, 1288-1298). We therefore generated rod-specific Arl3 knockouts to elucidate the role of Arl3 in transport of photoreceptor membrane-associated proteins. Methods: Knockouts containing a gene trap in intron 1 of the Arl3 gene were generated using a EUCOMM cell line. Breeding with Flp mice, followed by mating with iCre75+ mice, generated rod-specific knockouts. 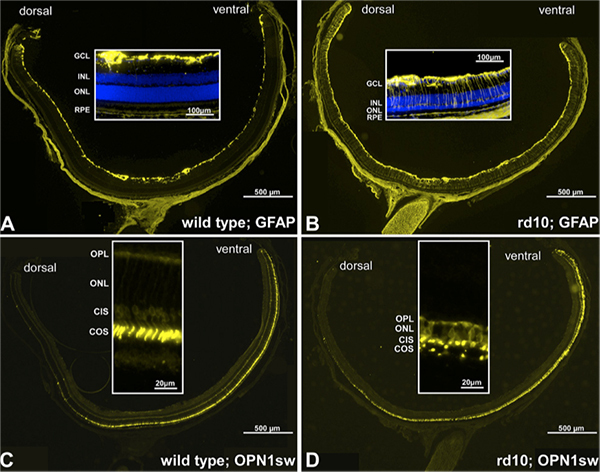 Photoreceptor function and retina morphology of wild-type (WT) and mutant mice were analyzed by confocal microscopy, ERG and immunohistochemistry. An Arl3-specific polyclonal antibody (Ab) was generated using a full-length recombinant Arl3 polypeptide expressed in bacteria. Results: Western blot of WT retina with anti-Arl3-Ab identified a 20 kDa protein, which was significantly reduced in two month-old mutant (Arl3flox/flox;iCre75+) retina. 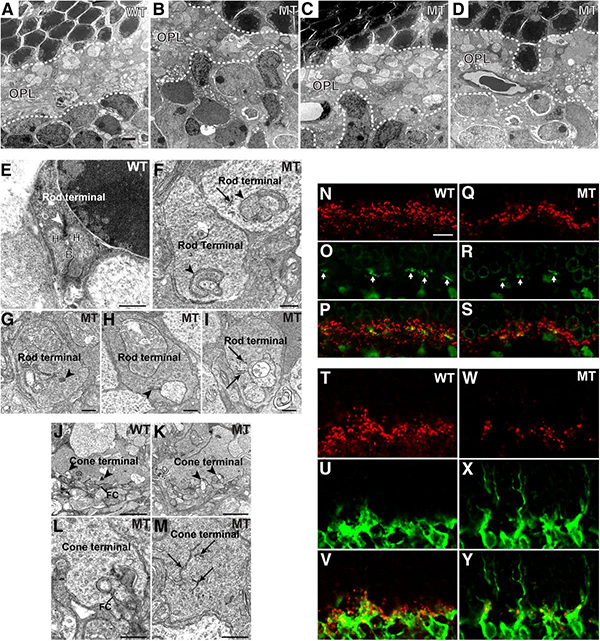 Immunohistochemistry revealed Arl3 localization predominantly in the inner segments of WT photoreceptor cells. 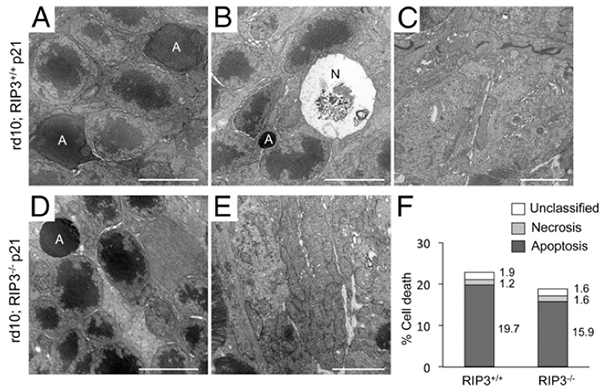 Arl3 immunoreactivity was absent in homozygous rod knockouts, but still present in cones and the inner retina. Scotopic and photopic ERGs of rod knockout and WT mice at PN15 had comparable amplitudes suggesting normal phototransduction. Retina histology of PN15 knockout mice was comparable to WT. One month-old Arl3flox/flox;iCre75+ mice showed reduced (80-90%) scotopic, but normal photopic ERG responses. In retinas of two month-old knockout mice, scotopic ERGs were extinguished, whereas cone ERGs were highly attenuated. Retinas of one month-old homozygous knockout mice had 4-5 rows of nuclei in the ONL, and only one row in two month-old mice. 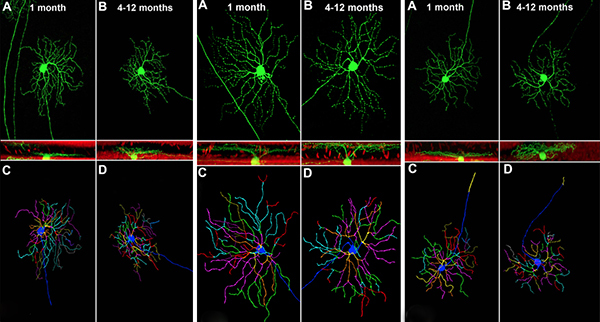 Immunohistochemistry of PN 15 and one month-old retina sections revealed that rhodopsin transport, as shown by rho1D4 labeling of ROS, is normal. Rhodopsin was undetectable in two month-old conditional knockout mice due to complete photoreceptor degeneration. 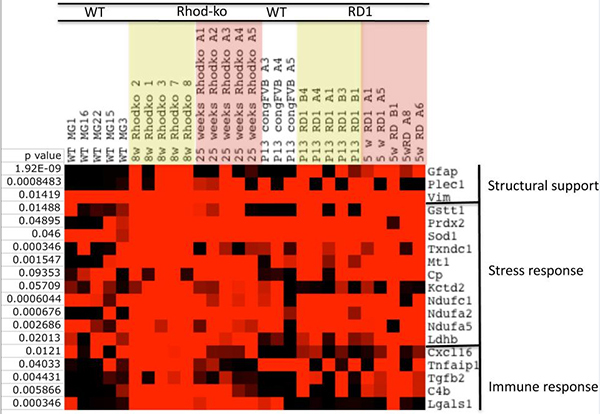 Conclusions: Rod-specific knockout of Arl3 revealed rapidly progressing photoreceptor degeneration, with knockout mice being completely blind at two months of age. Outer segment development appeared to be unimpaired by Arl3 deletion and rod photoreceptor function was normal at P14. “In 1983, after years of deteriorating vision, John Hull went completely blind. For the next three years he kept a diary on audiocassette. 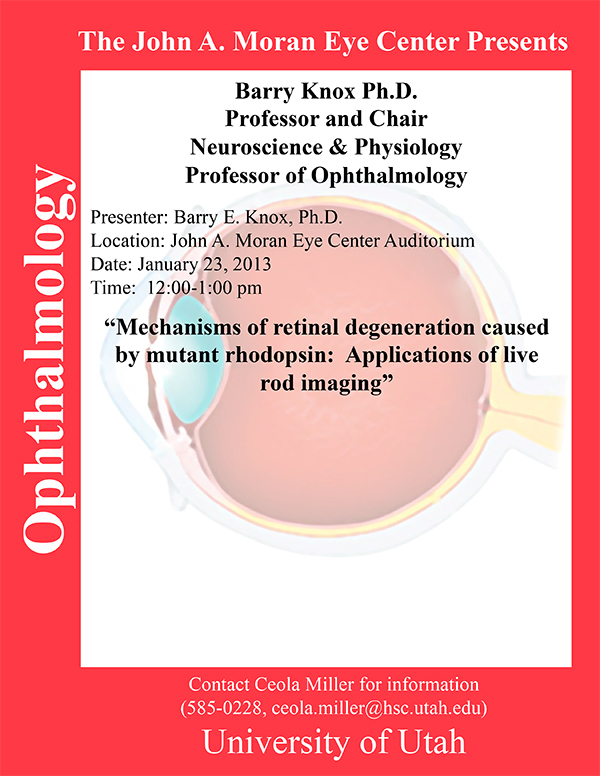 Barry Knox from Upstate University of New York, Departments of Neuroscience and Physiology, Biochemistry and Molecular Biology and Ophthalmology will be delivering a talk on Mechanisms Of Retinal Degeneration Caused By Mutant Rhodopsin: Applications Of Live Rod Imaging, January 22nd, 2013 in the John A. Moran Eye Center Auditorium. Retinal degenerations are accompanied by retinal remodeling events. These events alter the structure and function of the retina and involve to a large extent, Müller cells which seem to serve as pathways for neuronal migration. 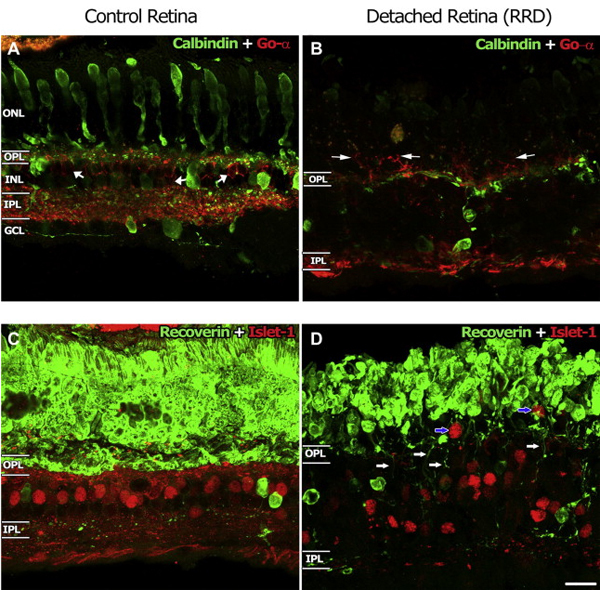 This paper by Karin Roesch, Michael B. Stadler and Constance L. Cepko looks at gene expression changes in the Müller cells, one of the glial cells of the retina as the rd1 mouse retina degenerates. 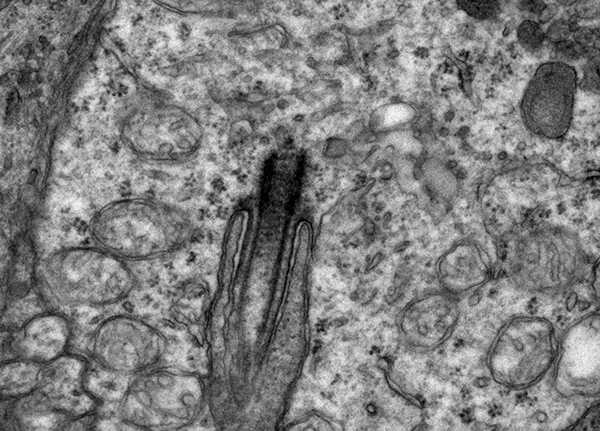 While the paper is not terribly conclusive in its definition of genes or pathways involved, (partially I suspect because of the limited time points examined and the late point in the examinations), this paper does however point in a direction that is useful to the retinal degeneration community. 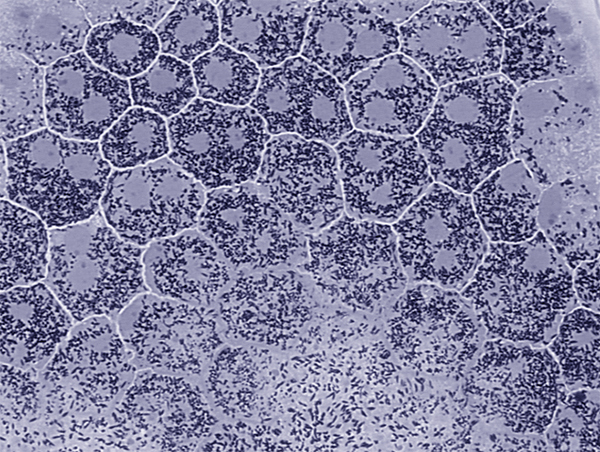 Specifically, Müller cells are fundamentally involved in the remodeling process. Intervening there is an opportunity to arrest or slow down the retinal remodeling process to allow for interventions and understanding which genes are involved is a good first step. 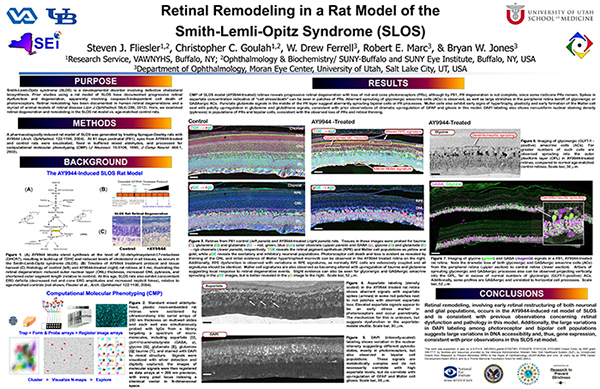 This is an important issue for anyone involved in using murine models of retinal degeneration. It turns out that contamination of Rd8 mutation in the B6 mice is more wide spread than the C57BL/6N mice. Labs worldwide are going to have to reassess their data due to this mutation and all reviewers will ask about this in the immediate future. The genotyping analysis of a variety of vendor lines is described in this paper by Mary J. Mattapallil, Eric F. Wawrousek, Chi-Chao Chan, Hui Zhao, Jayeeta Roychoudhury, Thomas A. Ferguson, and Rachel R. Caspi. The take home message is that the rd8 mutation is in the C57BL/6N strain which is used worldwide to produce transgenic and knockout models. The implications for non-vision labs are not as clear, but for vision labs, substantial disease can be present unrelated to another specific disease gene and will need to be accounted for. 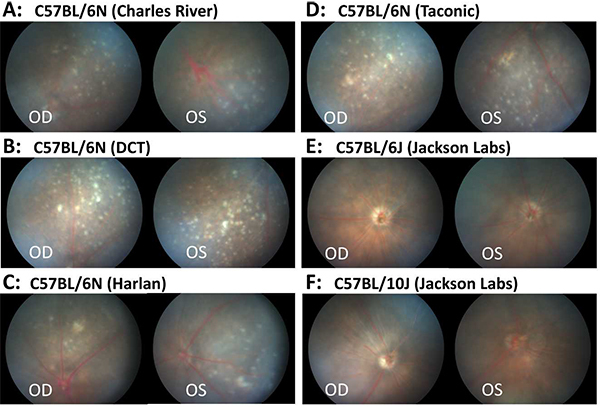 This manuscript by Clairton F de Souza, Michael Kalloniatis, Philip J Polkinghorne, Charles N J McGhee and Monica L Acosta examined retinal remodeling in response to a form of retinal detachment. Rhegmatogenous retinal detachment. The authors describe the changes observed and note that retinal plasticity is acute and likely occurs quickly enough that it may explain persistent vision loss post-reattachment. They also later conclude that retinal detachment, particularly with macular involvement is an emergent condition which is a fundamentally important conclusion.